Considering electronic waste: the view inside a bustling electronics market in Bangkok, Thailand. A new United Nations agreement seeks to diminish the damage caused by electronic waste through the collection and recycling of hazardous materials, as well as by introducing measures to improve the ways in which this equipment is managed. According to the UN International Telecommunication Union (ITU), electronic waste is expected to grow exponentially, particularly in developing countries, yet only 13 per cent of electronic waste is recycled, many times without safety procedures in place. The agreement, which was signed between the ITU and the Secretariat of the Basel Convention (SBC), intends to strengthen collaboration between information and communications technology (ICT) and environmental policymakers to address this issue. “The ICT sector is already making significant progress in improving its environmental performance and reducing e-waste through improved best practices and standards,” said ITU Secretary-General Hamadoun Touré. Electronic waste, which contains toxic materials used in the manufacturing process, can cause widespread damage to the environment and human health. Through the agreement, which was signed yesterday, ITU and SBC will exchange information and practices and will work on joint projects and programmes to set ICT standards and raise awareness among countries about electronic waste management. 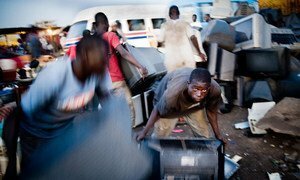 West Africa is facing a significant increase in waste generated by electronic equipment which poses mounting health and environmental risks, according to a United Nations report released today.